This is the slot you’ve been waiting for. Space Wars Slot Machine hits it out of the park… into the next galaxy. 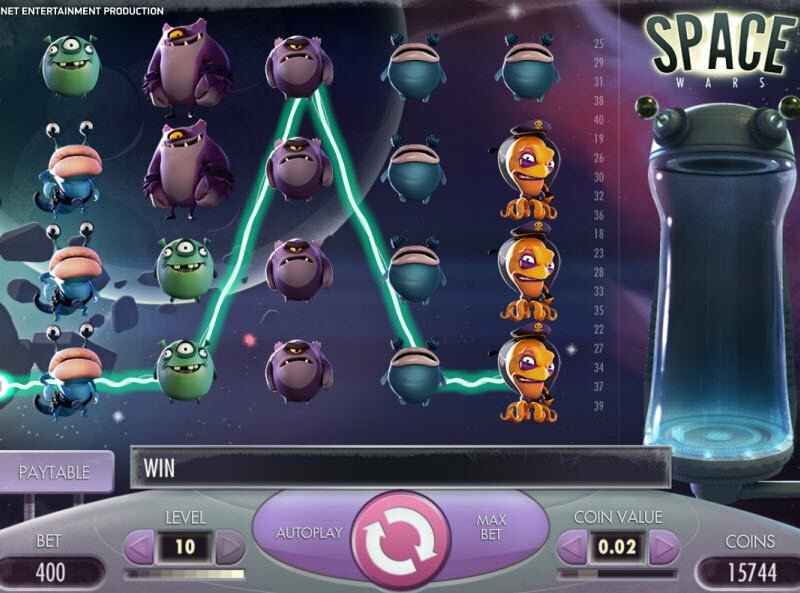 The slot game has extraordinary 3D graphics of aliens and a whole lot of cool features. You can even re-spin after every winning combination for a second chance to win. You don’t want to miss out on Space Wars which thoroughly impressed me with its high-quality 3D graphics. This game should set the standard for all other online video slots. Complete with an excellent soundtrack, a re-spin feature, and 40-paylines, the Space Wars slot machine is out of this world. Greetings Earthlings! You have now arrived in outer space. 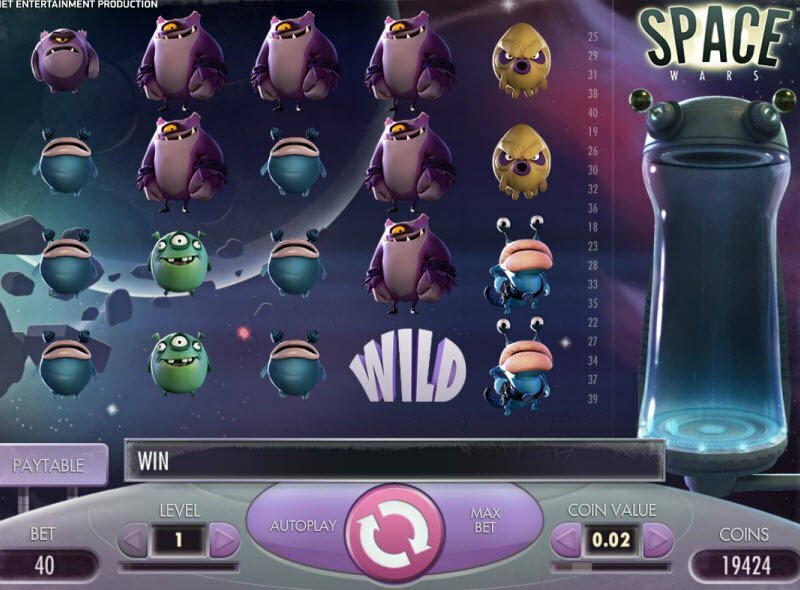 The Space Wars Slot Machine features creatures from out of this world. 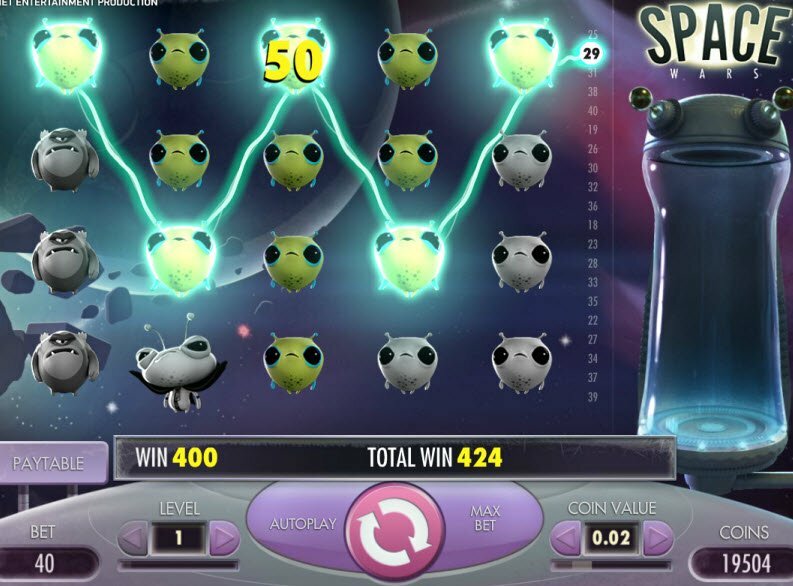 The animations of extraterrestrials that spin around the slot reels will impress anyone. During a winning combination, the bet line lights up like a lazer. Then the matching aliens pile into the capsule and teleport into a far off galaxy. Meanwhile the soundtrack plays epic music in the background that go perfectly with the theme. Space Wars might just have the best slot machine graphics in the entire universe! On top of having an enormous number of paylines, the Space Wars Slot Machine contains a distinctive Re-Spin feature. After a winning combination, the reels will re-spin giving you a second chance to win even more money. The Space Wars Slot Bonuses provide a very unique gaming experience. First of all, the slot reels include 40 total paylines. On top of having an enormous number of paylines, the Space Wars Slot Machine contains a distinctive Re-Spin feature. After a winning combination, the reels will re-spin giving you a second chance to win even more money. In addition, Wild Symbols substitute for all symbols. What’s even better? With the right combination, you could win up to 400,000 coins!